Cornerstone Performance is a cloud-based goal, competency, development planning, and performance review solution for businesses of all sizes. The software aims to assist businesses in creating and promoting a culture of continuous development, and enables managers to align employee goals with organizational strategies and benchmark employee performance. With Cornerstone Performance, employees can set meaningful goals which align with business objectives, with weightings and deadlines, and track their progress towards and achievement of those goals. Users can also identify when goals may need to be adapted to meet changing business initiatives. 180- and 360-degree feedback enable the identification of employee competencies and any skills gaps. The skills matrix allows managers to match talent to roles and discover skills gaps to be closed. Cornerstone Performance allows users to request feedback from their managers and peers, and drives structured conversations between managers and employees. Prompt provision of feedback enables coaching of employees in necessary areas. Observation checklists also allow managers to observe, record, and assess employee skills in real time when out in the field, with the ability to automate recording and reporting. Overall, it meets our fairly complicated needs for performance management, but I wouldn't make the decision to go with Cornerstone if I could do it all over again.This system is highly customizable - pretty much any type of performance process can be plugged into this product. The system comes with several ideal features out of the box, such as inappropriate word filters (the bane of HR's existence when managers complete reviews), simple and complex individual or team goal structures, and a simple, easy to use interface for employees. This system is highly customizable - pretty much any type of performance process can be plugged into this product. The system comes with several ideal features out of the box, such as inappropriate word filters (the bane of HR's existence when managers complete reviews), simple and complex individual or team goal structures, and a simple, easy to use interface for employees. Because this system is so customizable, plan on spending at least 3-6 months configuring the system for use. Even after 3 years of using this system, we still regularly find things that need to be set up differently or that we didn't even know existed. Additionally, the performance tasks are rigid once deployed. For example, you cannot change the verbiage in a notification email once the performance task is deployed, so if you want to word something differently or made a mistake when setting it up - you're stuck with it until you either delete the task (and roll out a new one), or until the task period expires. Employees can have a look at the performance feedback through 360-degree feedback from numerous sources as being fair and reliable – and are most probable to change their behaviors and increase their performance if they got the idea about the feedback coming from various sources. Apart from being subjective, it assists the employees in growing and developing by increasing the real-time input from the individuals that work near to them. This software also helps the managers to get a productive understanding of the employees’ performance and supports the remote workers. 360-Degree Feedback Software is best for the identification of behavior gaps and performance. When I use this software, it gives me a clear picture of how performance and behavior are interlinked in the workplace. It expands my range of information through the recording of all the relevant information among different evaluations. When properly implemented and designed, I use this software to encourages multidirectional and personalized responses that provide an overview of the behavior of employees. It is also involved in my agreement upon expectations. 360-Degree Feedback Software is best for the identification of behavior gaps and performance. When I use this software, it gives me a clear picture of how performance and behavior are interlinked in the workplace. It expands my range of information through the recording of all the relevant information among different evaluations. When properly implemented and designed, I use this software to encourages multidirectional and personalized responses that provide an overview of the behavior of employees. It is also involved in my agreement upon expectations. Cornerstone is the best and most comprehensive solution that I have seen for talent management. I have used the LMS, Performance, Succession, Connect and Extended Enterprise modules. CSOD continues to make enhancements to their product, especially with Learning, Connect and Performance, but where they are lacking is in enhancements to their mobile app and to their Succession module. While I do find great value in reaching out to their Global Product Support team, it will sometimes take days and even weeks before you get a response from them on a case. The communication to the customer is lacking there. Additionally, I find that some of the modules, such as Performance and Succession, can be really complex and require a lot of testing and trial and error to get things right. It does help that you are given two test environments (Stage and Pilot) to test things in. The quarterly releases have also gotten better over time, with many resources that can be used throughout User Acceptance Testing and the rest of the release cycle. Change is not always handled seamlessly for the customer, as we have experienced major delays when our Account Manager was on leave and also our Client Success Manager was out on leave. The people who filled in for them seemed overwhelmed and as a result there was a lack of communication. The 360 Degree performance review functionality can be great if you make the initial time investment to set it up. The one thing that Cornerstone does not provide with their 360 functionality is benchmarking with other companies, which our HR decided they wanted to do and therefore went with a different vendor for 360 reviews. Overall, Cornerstone is a great encompassing talent management system and I have not encountered another company that comes close to what they offer. Cornerstone Performance Cloud offers a robust, and very customizable tool to help manage your employees' performance. With tools to set and align Goals to organizational values, development plans that allow users to pull in recommended training based on their competency assessments or career interests, and observation checklists to certify skills and qualifications, the Performance cloud helps our organization better understand and assess the talent that we have so that we can engage and empower them to develop personally and professionally. We were able to totally makeover our performance processes now including goal setting, and development planning as part of quarterly "check-ins" (mini performance reviews) which ensure that problem areas are addressed in a timely manner and there are no surprises during the Annual Review. 360 Reviews allow us to collect feedback from co-workers and external partners to ensure the quality of services our staff provide. Initial testing and configuration can take a little time, but is well worth it. Annual Reivews are no longer just a pile of paperwork for our HR department, but the feedback is relevant and actionable. Cornerstone Product Support is knowledgeable and timely in their response. I love that Cornerstone really listens to their clients. Suggestions and feedback made to Cornerstone are actually reviewed and often implemented. Their product is always growing and improving. Our experience with Cornerstone has been rough to say the least. From our initial sales meetings and implementation there have been things that have just not gone as promoted. As a regulated medical device manufacturing company we have very specific expectations out of our LMS and Cornerstone claimed to be able to support those expectations and has fallen short in some areas. That being said, they have improved over the years and are much better with being transparent with us then in the past. We struggle with using a cloud based LMS for two reasons. One because our requested enhancements are usually denied or go into the black hole of a system that uses votes from other clients to assess other clients interests. As I mentioned we have very specific needs which aren't likely to receive a large number of votes. And second, when changes are pushed to our portal automatically we then have to retrain our global admins and users. It sometimes feels like you have to ask the same questions over and over to receive help. On the pro side I'd say the user interface is a big pro. The users seem to like the look and feel of cornerstone much better than our previous LMS. If we had to do it all over again would we cornerstone in the first place, maybe not, but as I mentioned previously there has been some improvement over the years and we will continue to voice our requests until it exceeds our requirements. Contact Cornerstone for full pricing information. Goal-setting tools allow employees to set clear, meaningful, and measurable goals which align with overall business objectives, and users can can track progress towards goals at any time. Employee skills and competencies can be tracked, allowing managers to match talent to roles, identify skill gaps, and determine what training is required. Continuous coaching and feedback can be provided to employees to create a culture of continual development through providing timely feedback and driving structured conversations between managers and employees. Observation checklists allow users to observe, assess, and record employee skills in real-time to determine their competency. Development plans can be created to develop employee skills and cultivate talent, and insight can be provided into how employees contribute to overall business goals, with the aim of increasing employee engagement. Below are some frequently asked questions for Cornerstone Performance. Q. What type of pricing plans does Cornerstone Performance offer? Q. Who are the typical users of Cornerstone Performance? Q. 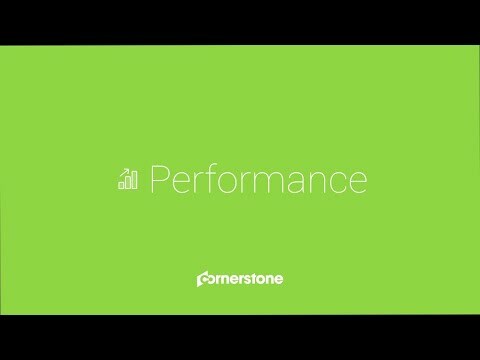 What languages does Cornerstone Performance support? Q. Does Cornerstone Performance support mobile devices? Q. Does Cornerstone Performance offer an API? No, Cornerstone Performance does not have an API available. Q. What other apps does Cornerstone Performance integrate with? Q. What level of support does Cornerstone Performance offer?